Apple's iPhone once again topped the J.D. Power and Associates rankings for customer satisfaction, marking 8 straight surveys of besting the competition. Apple's overall score of 849 out of 1,000 earned it a five-star "PowerCircle Rating" from the consumer advocacy group, which categorizes the company as "among the best" for customer satisfaction. 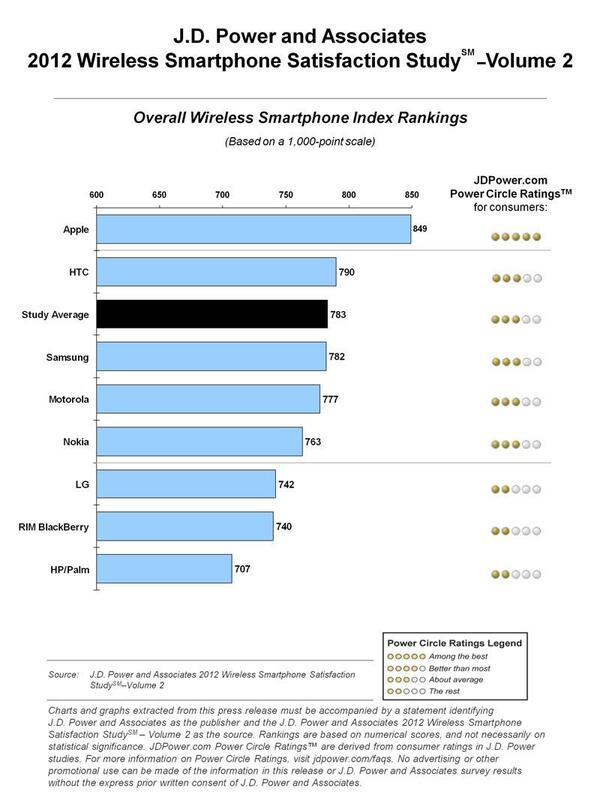 Apple was the only company in the 2012 Wireless Smartphone Satisfaction Study to earn that distinction. The 849 score for Apple put the iPhone maker in a class of its own, separated significantly from the rest of the pack. The company finished 59 points ahead of second-place HTC, which earned a customer satisfaction score of 790. Apple's heated rival Samsung came in third with a score of 782, while Motorola earned 777 and Nokia was given 763 points. At the bottom of the pack were LG, with a score of 742, RIM BlackBerry, with 740, and last-place HP/Palm, with 707. In all, smartphone makers earned an average score of 783 out of 1,000 in the J.D. Power and Associates Rankings. However, that average is heavily skewed by Apple's market-leading presence, as well as the inclusion of HP and its now-defunct Palm division. With those outliers removed, the average customer satisfaction score for smartphone makers drops to 768, or 81 points behind Apple. The study also found that the average smartphone owner who plays games on their device spends $13 more per month for their wireless service than a non-gaming user. Those who use social media applications on their handset also spend an average of $12 more per month on service. The survey also found that 47 percent of smartphone owners chose their particular handset because of specific features. Selling points for smartphone users include the camera, operating system, social media integration or gaming capabilities. Just 19 percent of customers in the survey chose their smartphone based on price, though that number is up from 14 percent a year ago. Finally, the survey also found that nearly two in 10 smartphone owners say they have experienced a software or device malfunction. Those issues are said to have a significant effect on overall user satisfaction  customers who indicated their device's software crashes at least once per week had an average score of just 663, nearly 200 points below the score Apple earned.